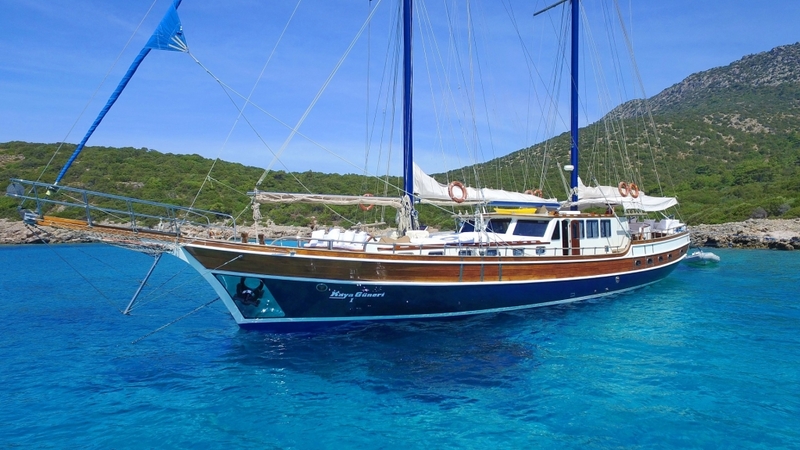 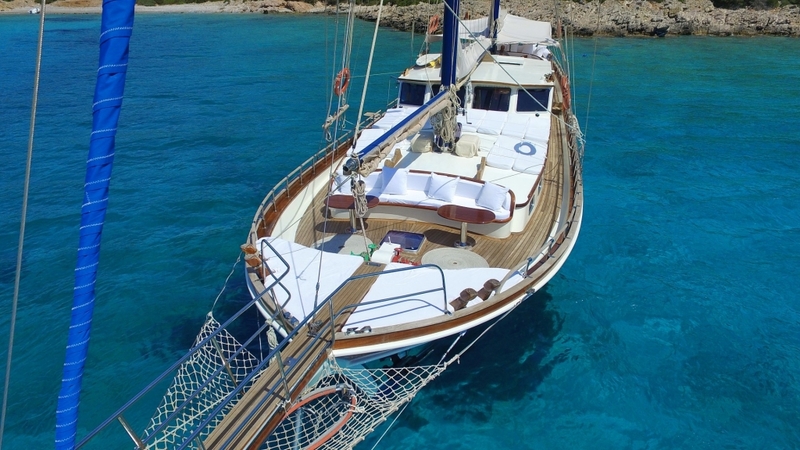 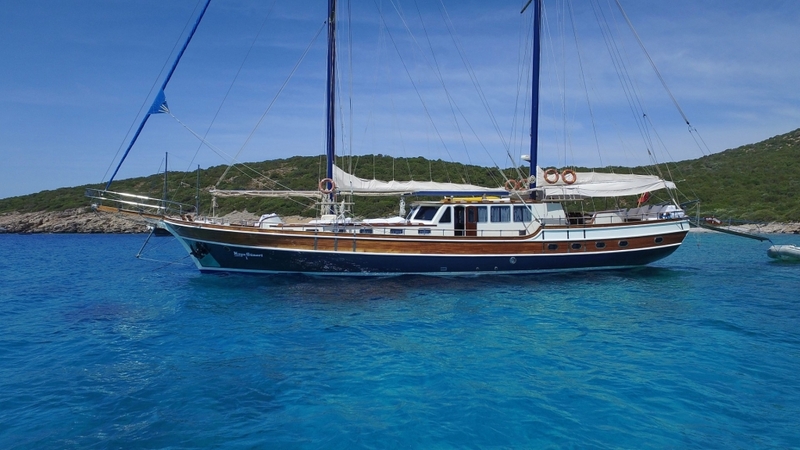 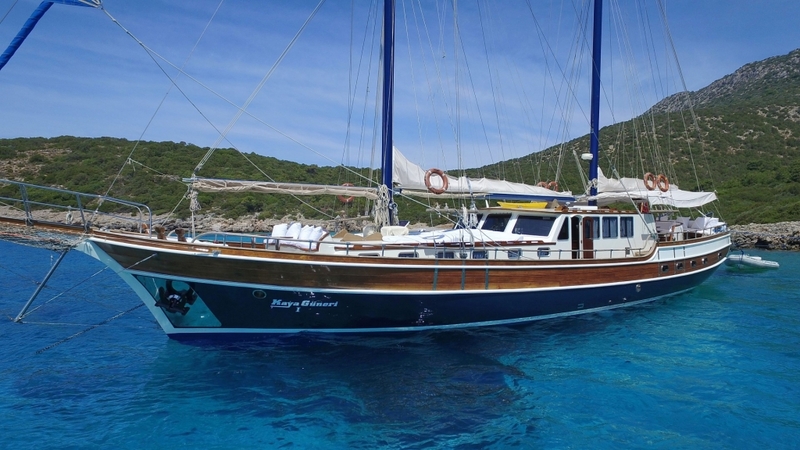 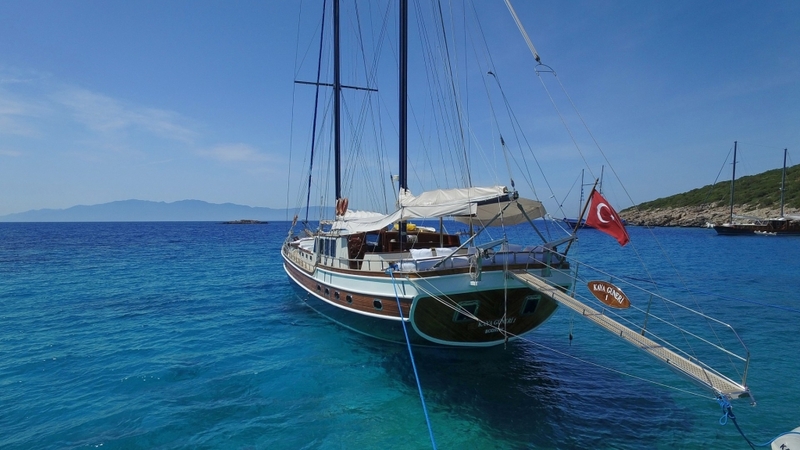 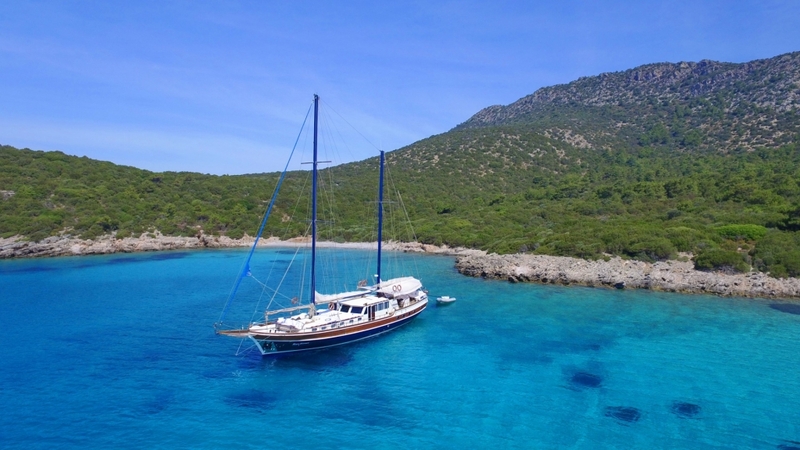 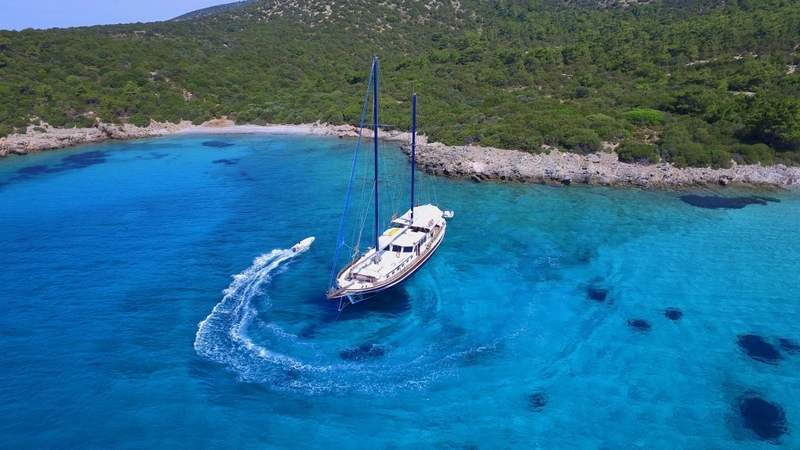 The blue hull of the luxury gulet Kaya Guneri 1 stands out in any bay, with her neat lines of a classic ketch gulet from Bodrum. 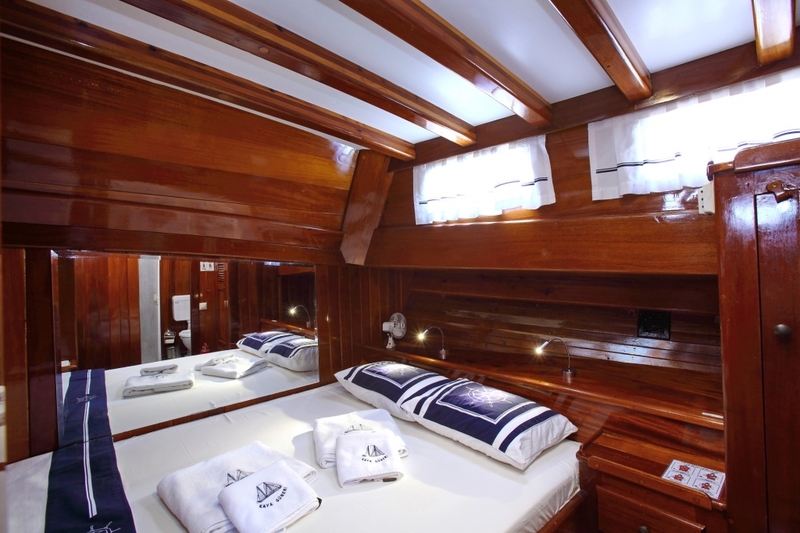 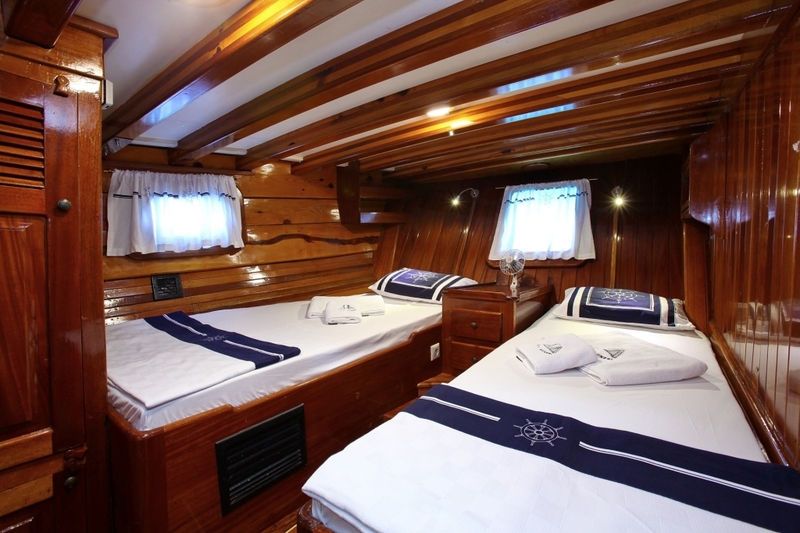 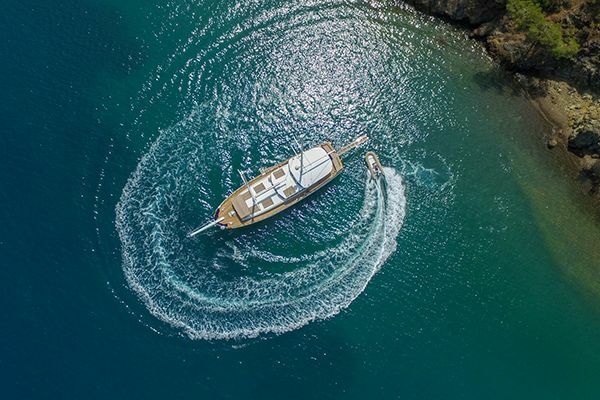 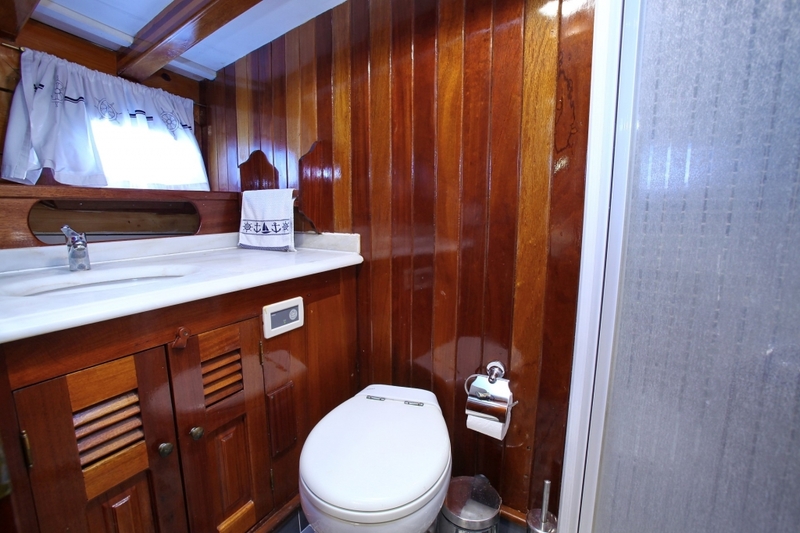 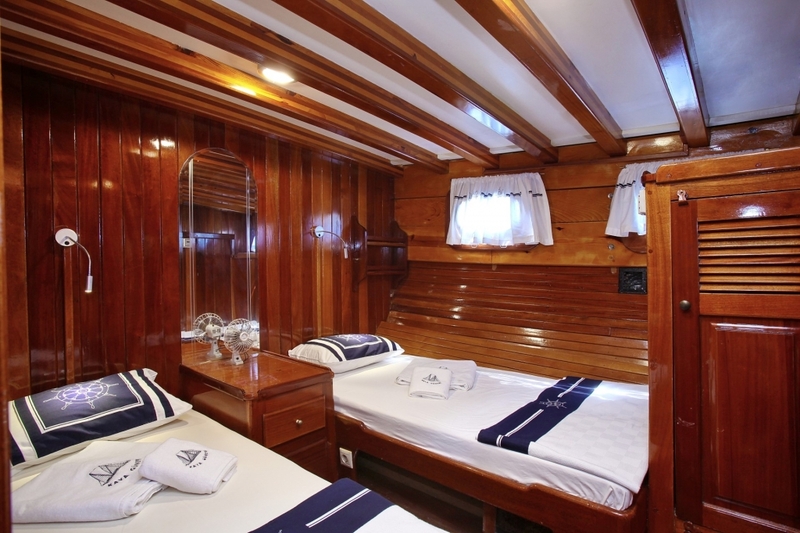 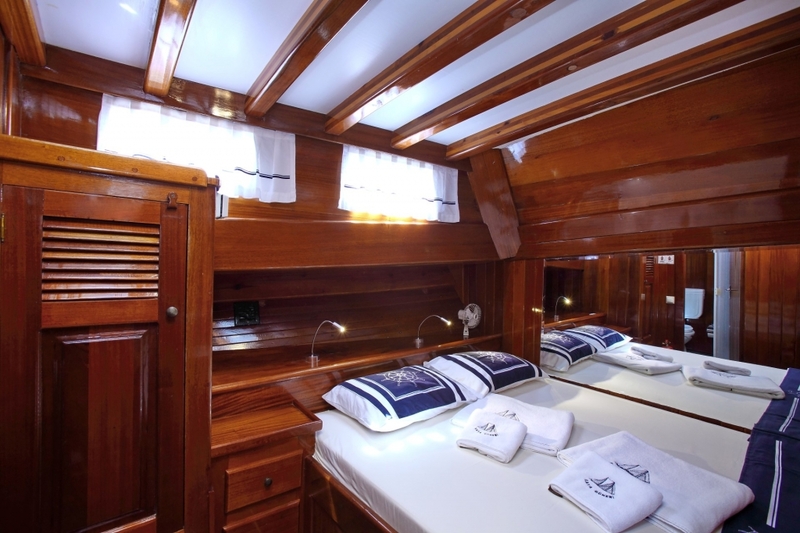 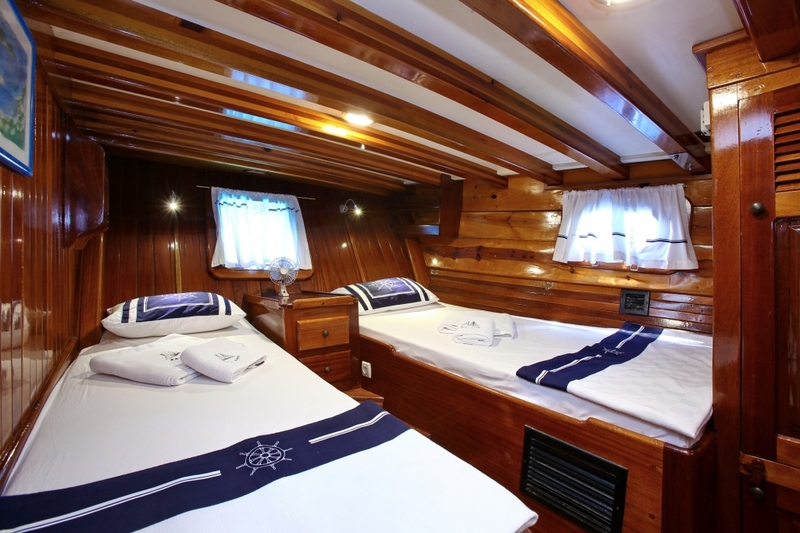 Within her 26 meters hull, a group of friends or family will find a very comfortable arrangement in the seven cabins which are a practical mix of doubles, twins and double plus single bed berth cabins. 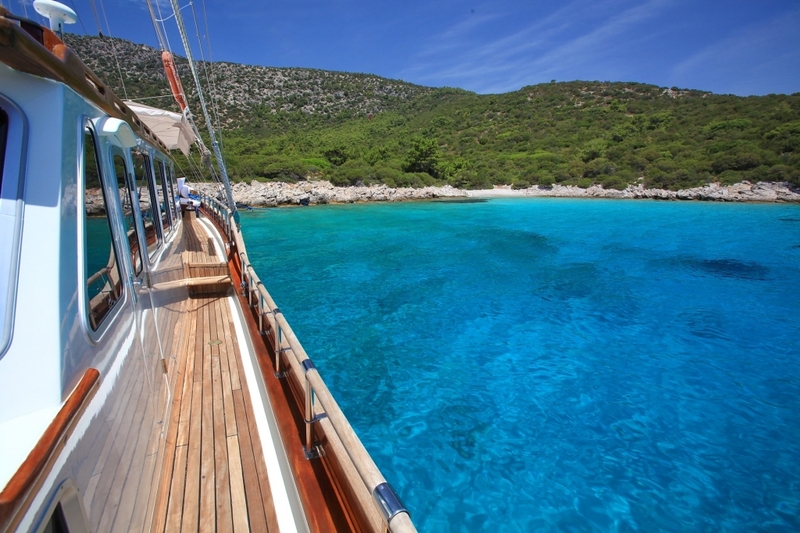 All cabins on gullet Kaya Guneri I have their own private bathroom with shower and toilet, and have air-conditioning available. 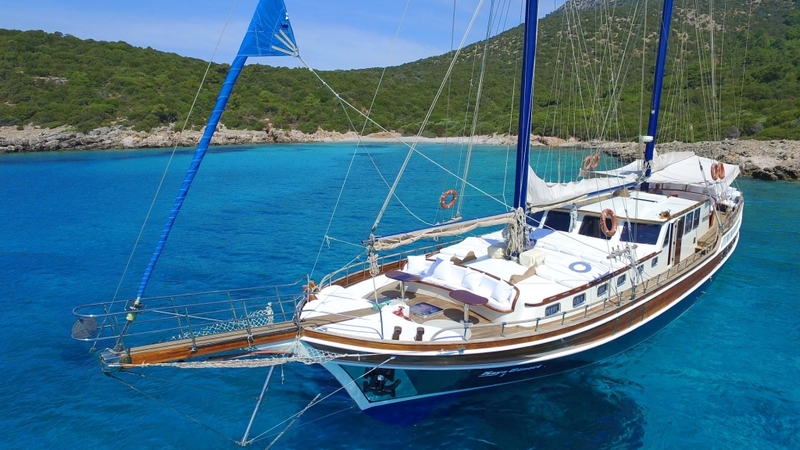 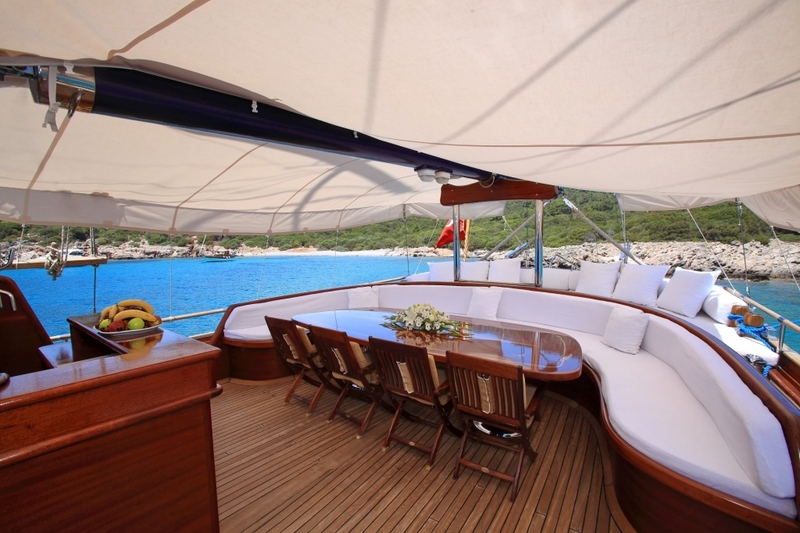 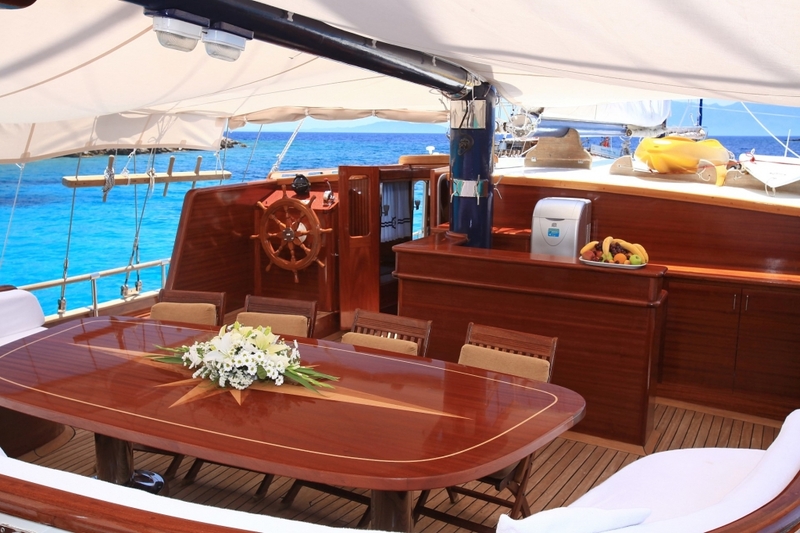 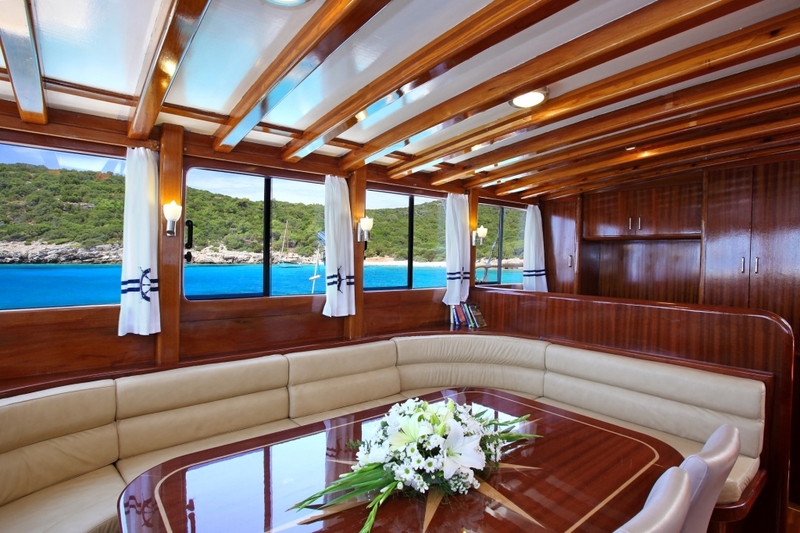 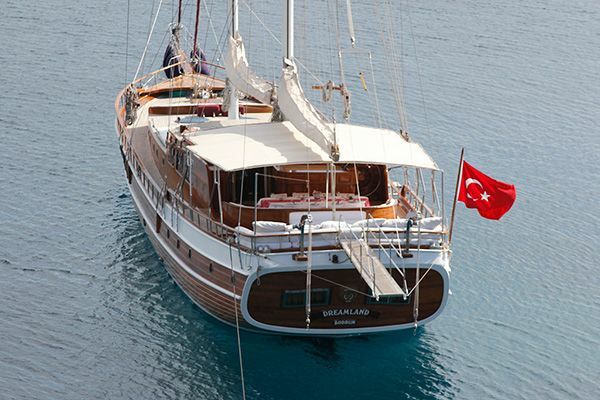 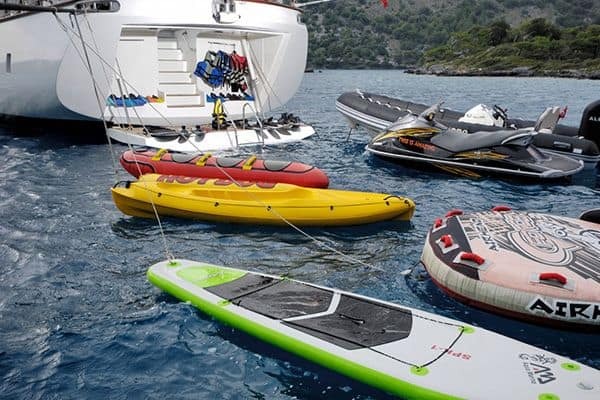 Groups of up to fourteen guests in Turkish waters, or twelve in Greek waters, enjoy comfort, attention and great service from the friendly and professional crew, who know the beautiful coastlines so well. 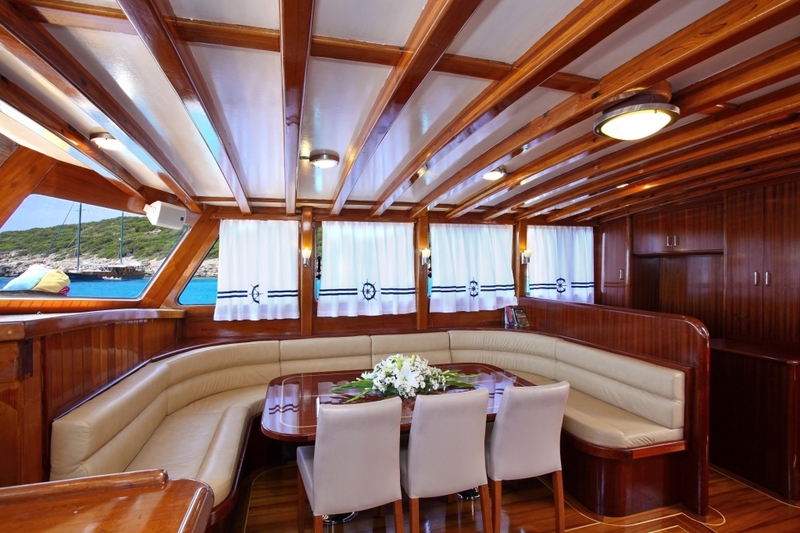 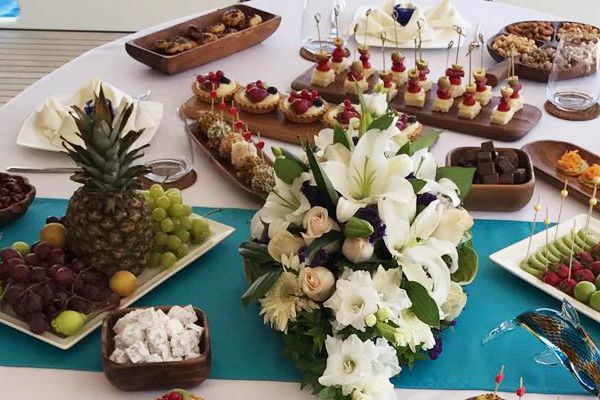 Wonderful meals appear from the fully equipped galley, and all guests enjoy them dining al fresco at the large dining table on the aft deck under the shade awning. 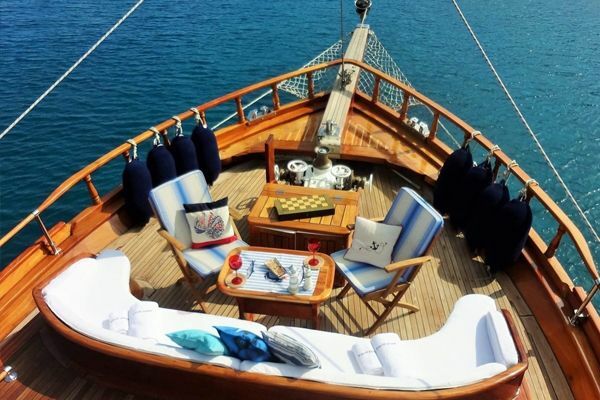 From the table it is not far to step back and rest on the inviting bank of cushions across the stern. 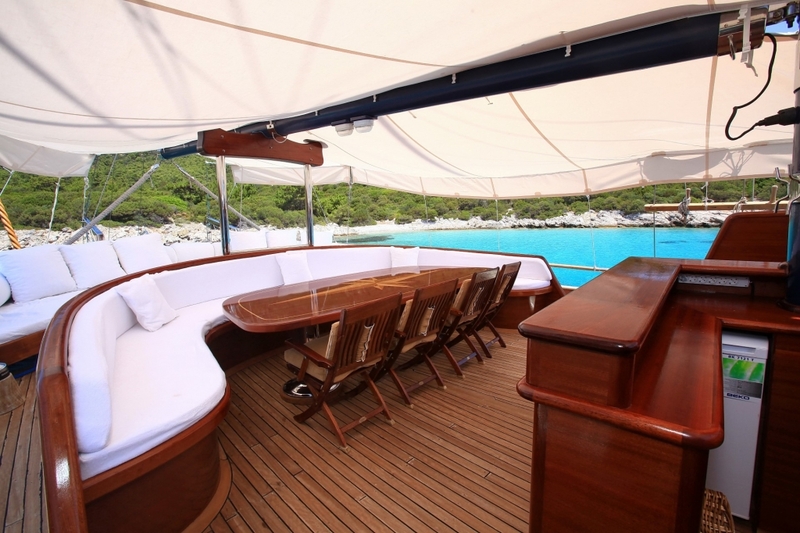 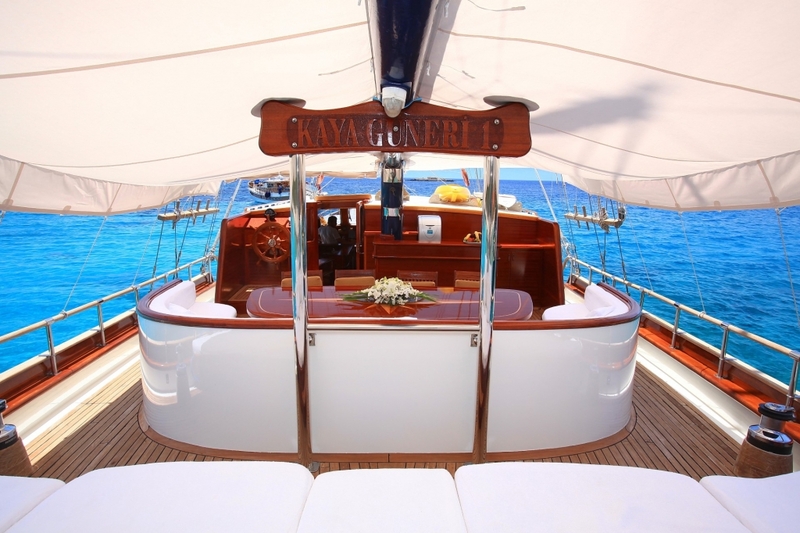 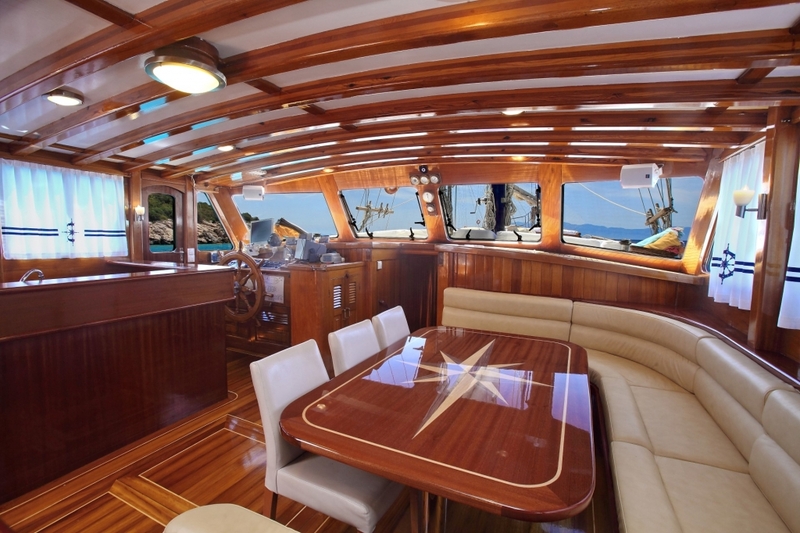 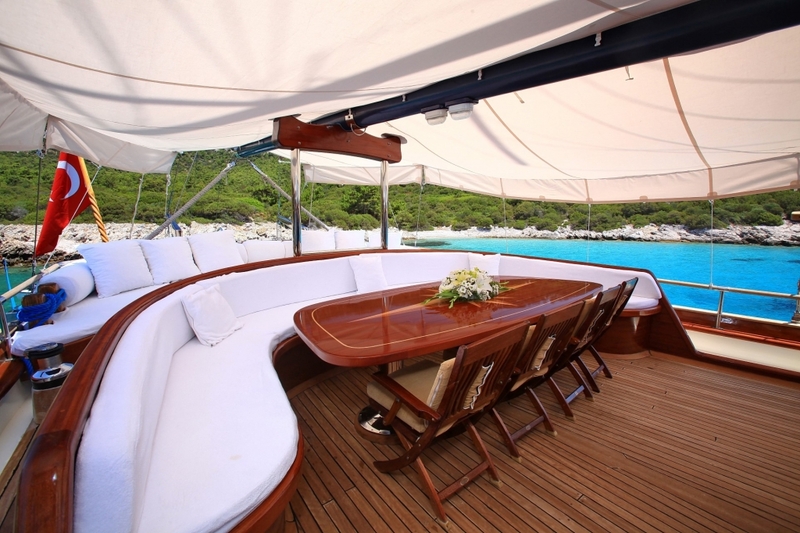 Or move forward to the fore-deck where the personal sunbeds await guests or a delightful bow seat with cushions and small tables. 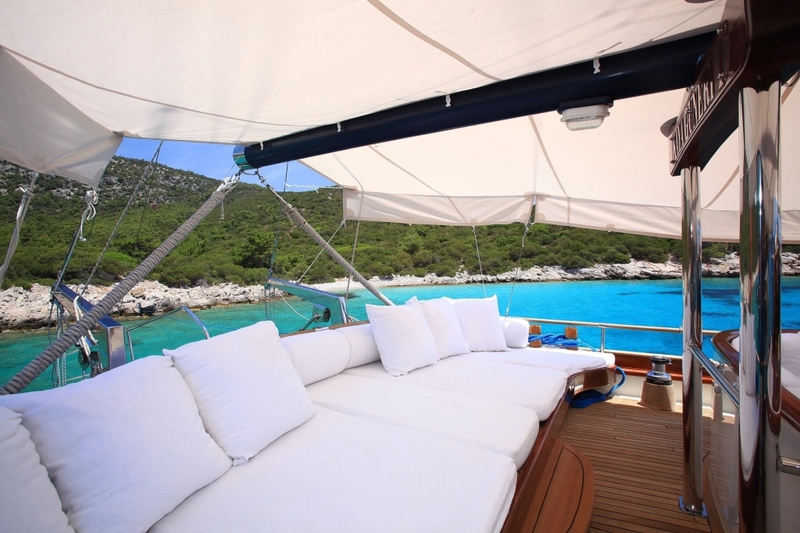 This is the favored spot to relax in the sun, share a drink and a conversation, or have a quiet read. 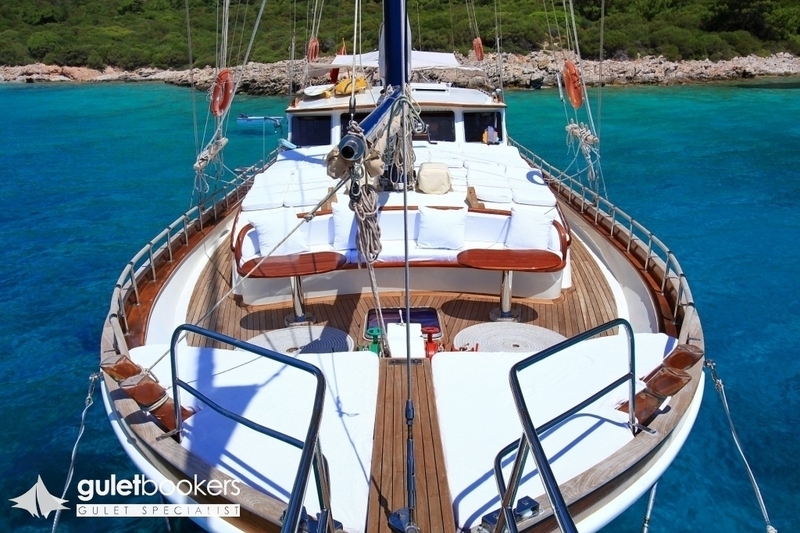 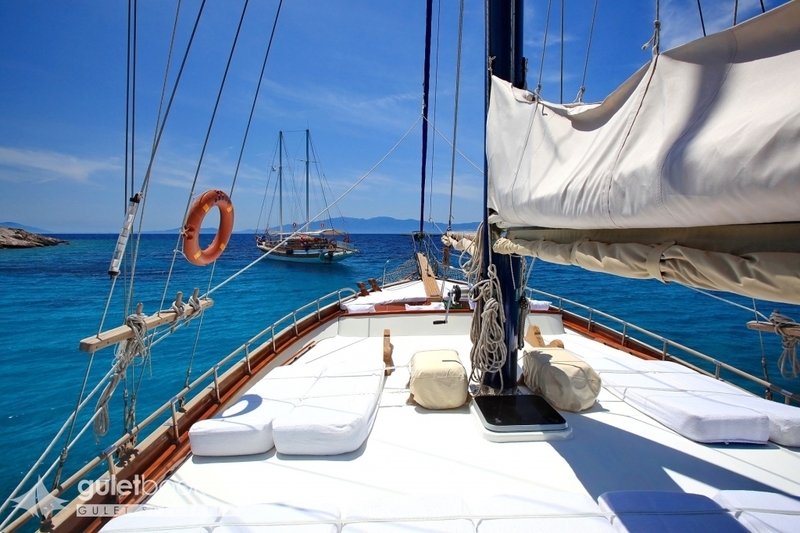 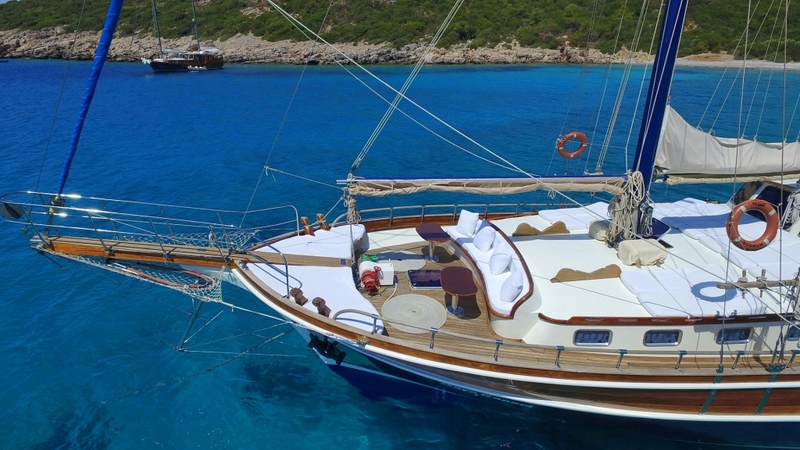 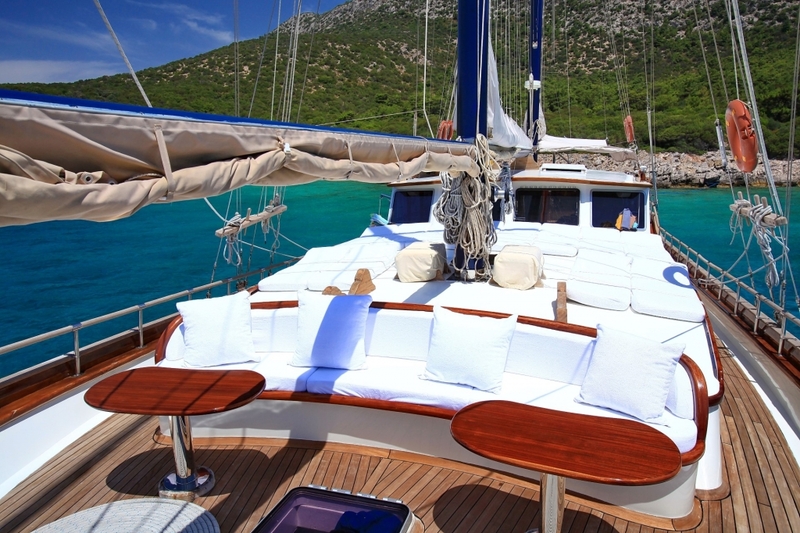 From the bow seat guests enjoy the great views of the coastline when moving from bay to bay by either motoring or with the sails up for the very special experience on a gulet cruise holiday in Turkey.